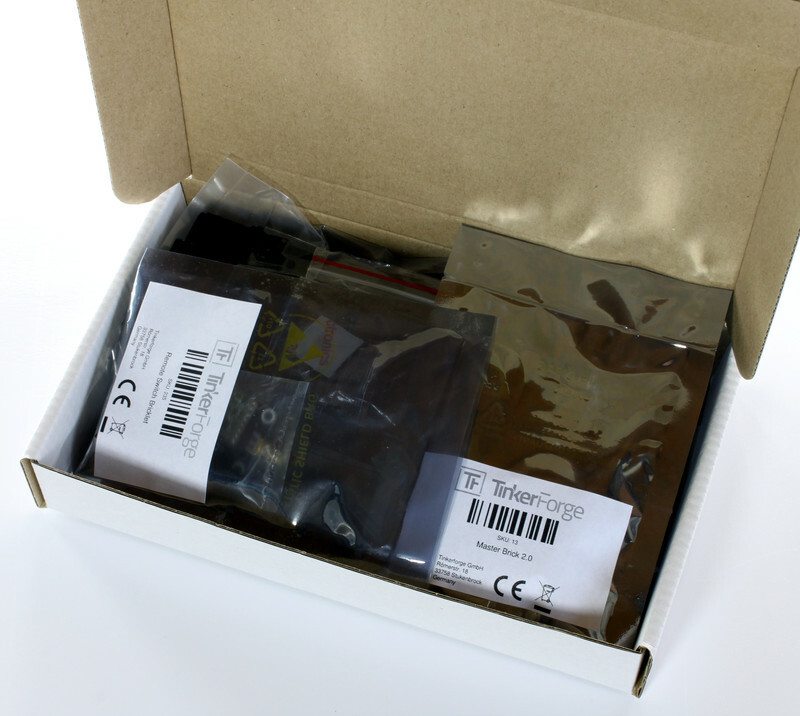 The Starter Kit: Internet of Things offers an easy access into the world of the Internet of Things. It allows to control many devices over the Internet. For that the kit is equipped with a Remote Switch Bricklet 2.0. It can be used to remotely control 433MHz mains switches, dimmers and home automation components. 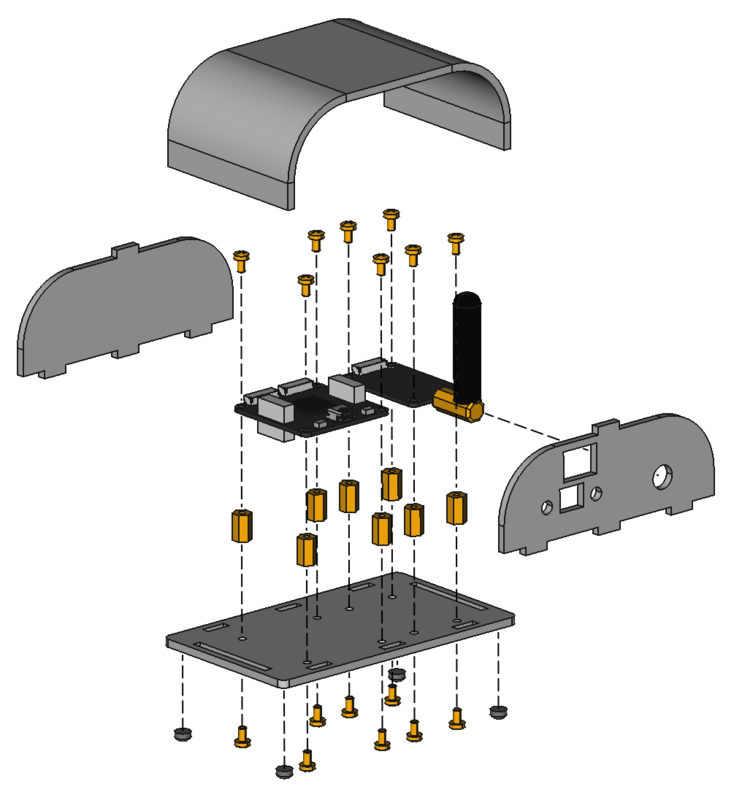 You can find a list of supported actuators in the documentation of the Bricklet. 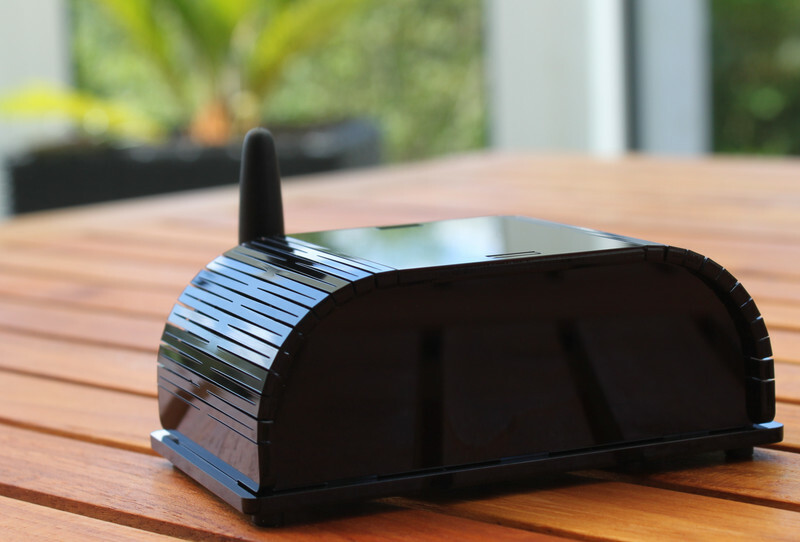 With the kit nothing stands in the way of turning your coffee maker on while you are heading home or to dim your living room illumination with your own cloud or with a Raspberry Pi. The website www.iot-remote.com gives you direct access to wireless actuators from any web-enabled device. 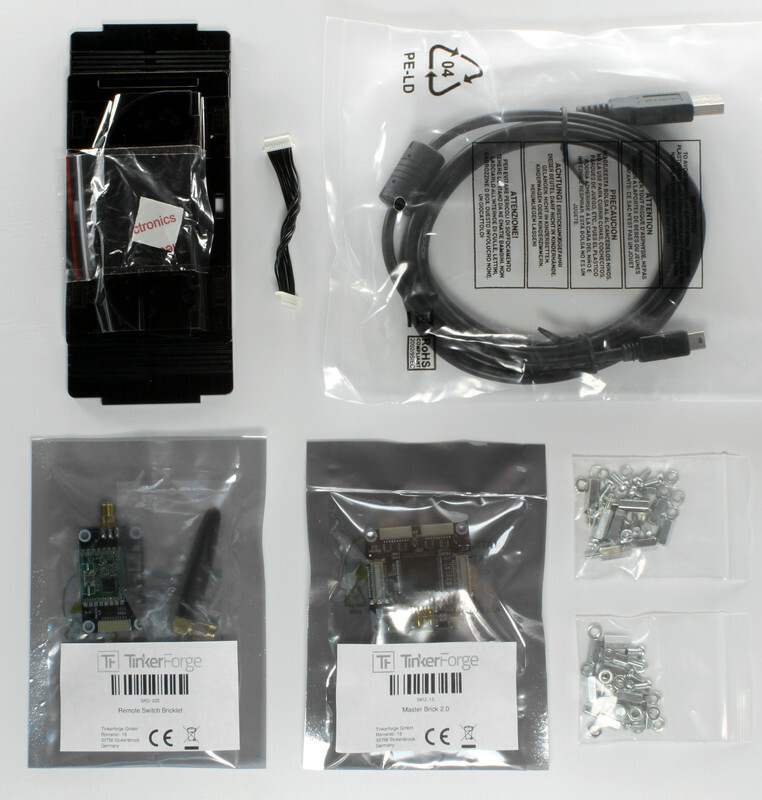 The kit basically consists of a Master Brick and a Remote Switch Bricklet 2.0 which is equipped with a 433MHz transceiver. Over the USB connection of the Master Brick you can control remote control mains switches or similar. An (Embedded-)PC (e.g. Raspberry Pi) either does the switching itself or it can serve as a gateway. With an additional Ethernet Master Extension it is possible to go without a gateway. This Kit was updated on March 20th 2018. We updated the Remote Switch Bricklet to version 2.0 and the Bricklet cable to the 7p-10p variety. All of the software was udpated to be compatible to both versions. As the next step test the Remote Switch Bricklet 2.0 with a remotely controlled mains switch. After that you can start to assemble the kit! The Starter Kit: Internet of Things comes with Master Brick, Remote Switch Bricklet 2.0, a 6cm Bricklet cable, two mounting kits and self-adhesive non-slip rubber feet. Building the case can be done in four easy steps. At first the protective foils on all case parts have to be removed. There is a foil on the front and back side. In some cases the protective foils may be hard to remove, you can use a cutter or similar as a lever to get to the foil. Screw the 10mm spacers (thread inside/inside) to the Master Brick and the Remote Switch Bricklet 2.0. If you want to use the Ethernet Extension, you should attach it to the Master Brick with 12mm spacers (thread inside/outside). In the last step you just have to plug the back part of the case into the bottom part. After that bend and attach the top part. Thats it, we are done already! The web site is very easy to use. With "+ New Remote..." you can add new devices. There are four types: A (Switch), B (Switch), B (Dimmer), C (Switch). The types can be configured dependent on the actuators that will be controlled (see list of supported actuators). Depending on the actuator there are different forms to fill. A precise description of the actuator types can be found in the documentation of the Remote Switch Bricklet 2.0. Devices can be controlled by clicking on the appropriate entry in the list. In the following we have the controlling site of a type A switch. The web site www.iot-remote.com does not have a log-in function. This keeps the site simple and to it is simple to start your own instance of the web site. 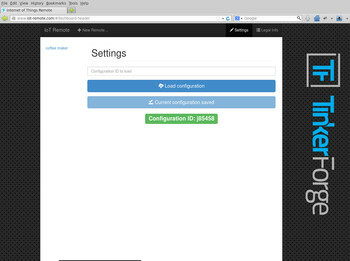 The configuration is saved locally in the browser with a cookie, by default it is not transferred to a server. If you only use the web site from one browser this is good enough. 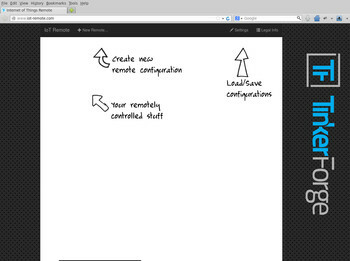 To use an already created configuration in different browsers it is possible to save the configuration on www.iot-remote.com and load it again in another browser. After a configuration is created it can be saved. You just have to click on "Settings" and then on "Save configuration". The server creates an configuration ID that represents the current configuration. Loading a configuration can be done analogously. Just enter the configuration ID in the appropriate field and click on "Load configuration". Subsequently the devices that are saved by this ID are shown on the left. It is as easy as that to host your own Internet of Things web server that can save configurations over WebSockets! 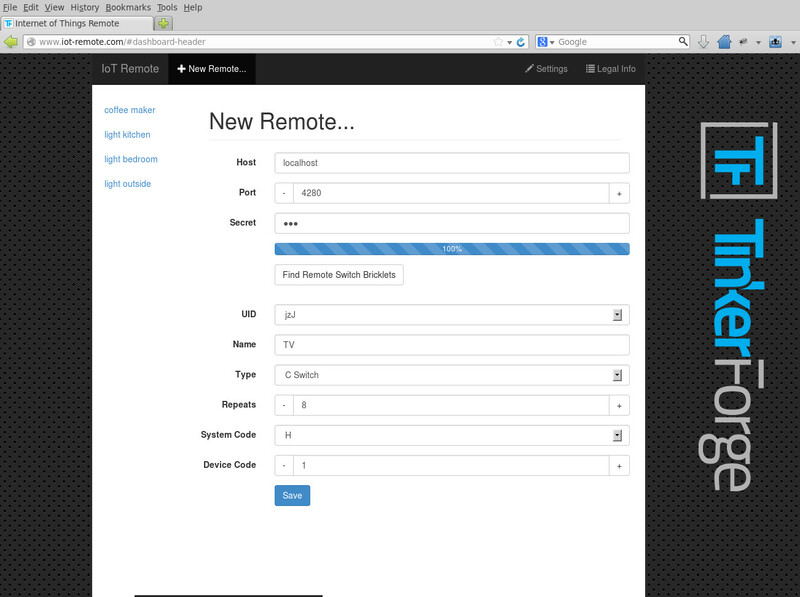 Beside the direct usage of www.iot-remote.com it is of course also possible to develop your own programs. The basis of this is the API of the Remote Switch Bricklets. The API is available for many different programming languages. The documentation of the API does have example applications for all of the programing languages that we support. Those examples are a good starting point if you are just starting to program the Tinkerforge hardware. 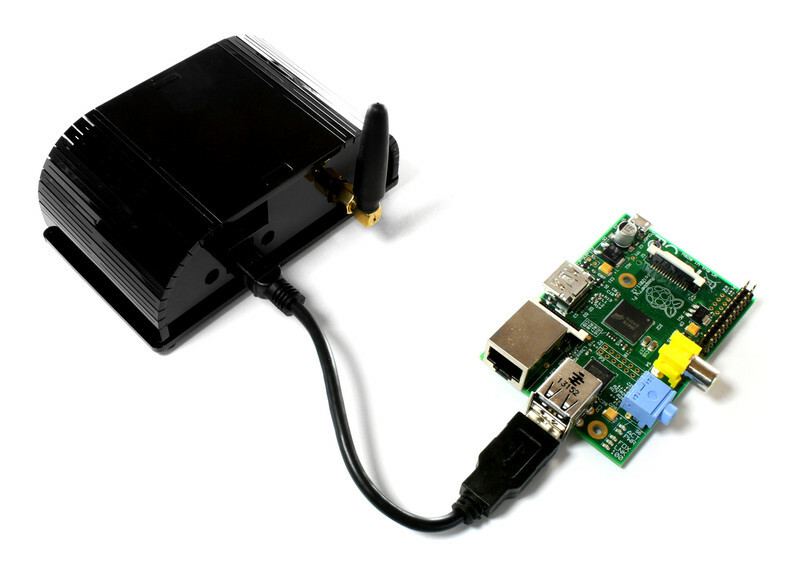 If you don't want to use a USB <-> Ethernet Gateway (PC, Raspberry PI, etc), you can use the Ethernet Master Extension. 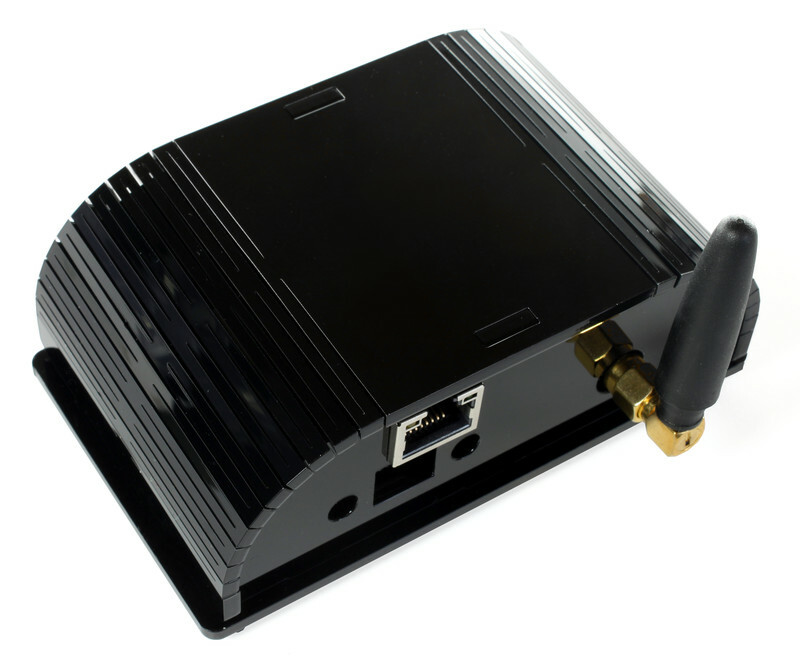 With the Ethernet Master Extension it is possible to directly communicate with the kit by a smart phone or tablet. 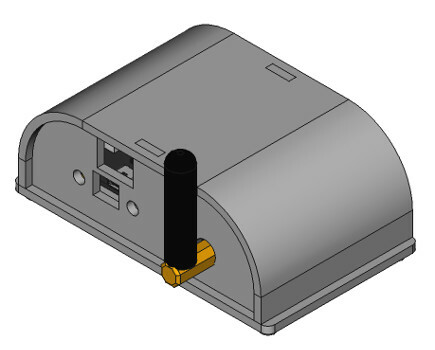 The case of the IoT kit does have the necessary slits to accommodate the Extension. The documentation has more information regarding the usage of the Ethernet Extension. 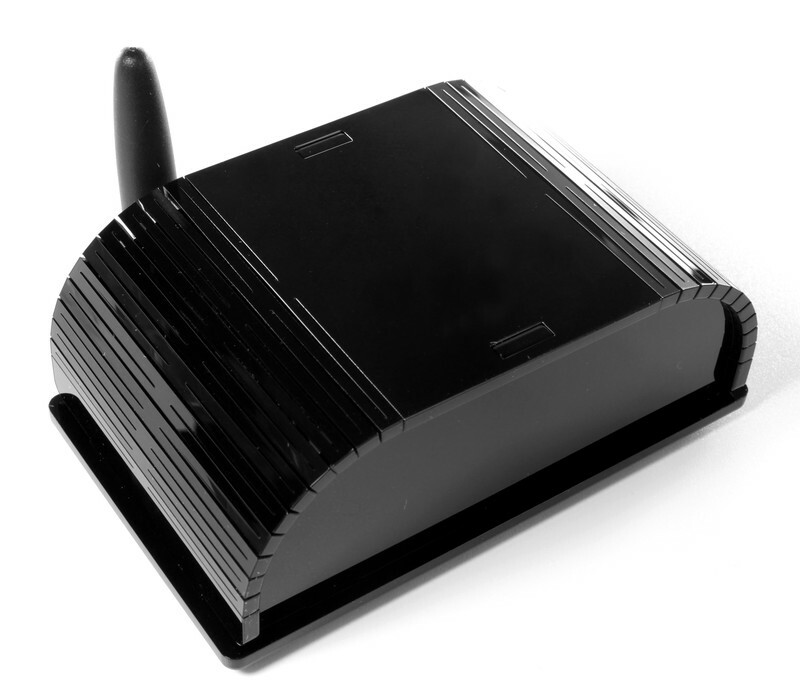 Motion detection with Motion Detector Bricklet: The Motion Detector Bricklet allows to detect movement. Together with the kit it is possible to turn devices on or off dependent on the presence of persons. Temperature-based control of window motors: With Bricklets such as Temperature, Temperature IR or the PTC Bricklet you can measure temperatures. Together with 433MHz home automation components you can open and close windows depending on the temperature. Daylight dependent blind control: With the Ambient Light Bricklet 2.0 you can measure the light intensity, it allows to control blinds dependent on light level. GPS based home automation: By using the GPS Bricklet or your smart phone with GPS you can control your home dependent on your position. As an example you could turn on the outdoor lighting if it is dark and you are approaching your home. Load switching dependent on electricity prices: If your electricity price depends on the time of day or on the current market prices you can switch loads on if the prices are cheap and off if they are expensive. Load switching dependent on power usage: Many intelligent electricity meters allow you to get access to the current power usage. Alternatively you can read the revolutions of an electromechanical meter with the Hall-Effect Bricklet. With this information you can control devices dependent on power usage.